The annual China Marine Economy Expo will swing into action again in Zhanjiang, Guangdong province, on Dec 14-17, to promote global marine industrial communications and development. 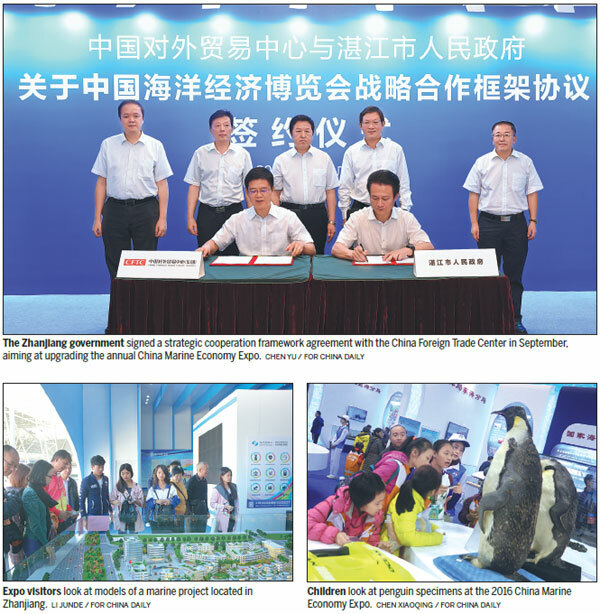 Hosted by the State Oceanic Administration and Guangdong provincial government, the expo is the only State-level comprehensive marine-themed expo in China. This year, the fair is expected to attract more than 3,000 exhibitors and more than 50,000 professionals from both home and abroad. The total number of visitors should exceed 300,000, according to the event's organizers. Organizers said that this year's fair will combine exhibitions with trade, compared with previous shows which focused purely on exhibitions. The Zhanjiang government signed a strategic cooperation framework agreement with the China Foreign Trade Center, the organizers of China Import and Export Fair, or Canton Fair, in September, aimed at upgrading the annual grand gathering for the marine industry. Officials said that Zhanjiang hoped the new partnership could turn the expo into a more professional and international event. The 2017 fair will have five zones - the national pavilion zone, industrial pavilion zone, tourism and culture demonstration zone, a goods exhibition and trading zone as well as a zone for people to experience new products or services. The show will focus on demonstrating the latest innovation in marine vessels, port logistic services, marine energy, marine engineering equipment, marine technology and tourism, as well as other areas. It will also display state-of-the-art technologies in the marine services sector, such as maritime information, the application of big data, positioning and navigation. Leading companies in the marine industry, including China Shipbuilding Industry Corp and China National Petroleum Corp, will display their latest products and industrial solutions in the four-day expo. Some financial service providers will also attend the exhibition. Apart from showing visitors the latest products and services, the fair will provide information for people to learn about new trends in the marine industry. The State Oceanic Administration will release a China Ocean Economic Development Index and invite leading industry figures to the expo, on the sidelines of the event. An array of professional forums will be held during the expo. Government officials, experts and business leaders both from home and abroad will deliver keynote speeches and hold in-depth discussions on new models and approaches to the development of marine economy. This year, expo organizers will upgrade the online platforms so people who cannot go to Zhanjiang can still participate in the online expo. The official website and its WeChat account have also been upgraded to enhance the experience of visitors and participants. The expo, launched in 2012, has become an important platform to promote China's Belt and Road Initiative, the marine economy and trade on the global stage. Organizers say the event's strong brand awareness attracts increasing numbers of visitors and businesses from various countries. Statistics from event organizers show representatives from 53 countries participated in the expo in 2016, up from 32 in 2014. The number of exhibitors hit 3,100 in 2016, an increase from 1,300 in 2014. Last year the show's transaction volume totaled 43.9 billion yuan ($6.64 billion), an almost two-fold increase on the 2014 level.